Overall, ACT! has met the needs we have when it comes to a database. We have had a few hick-ups but those have mostly been user errors. We really like that we have been able to customize the CRM to meet the needs of our non-profit. We are thinking of using the e-marketing solution more but have not totally transitioned from CC. The ease of use / template building seems a little more user friendly on our current CC solution. We also thought that the integration with QB would be a little easier. We have not found that to be the case at this point. We are able to keep much better records with ACT!. We had been using Excel spreadsheets but our non-profit membership was just getting to big. This has helped us all to keep up to date with our member information and provide better service to our members. Sign in to G2 to see what your connections have to say about Act! "As a full time Realtor, ACT has helped me keep up to date with my clients and prospects." The fact that I was able to create my own letters and/or campaigns to send to my clients and prospects. Plus the fact that I knew exactly when to send things out using the calendar on a daily basis. I also liked the fact that the program was able to integrate all my e-mails to my contacts and that I am able to save any attachments in the contact's history. That way I didn't need to "search" in any other are of my computer files. Although I don't use the on-line version that often, I find it doesn't really have everything thing available to me at the click of a key stroke. I am also finding it a little more confusing now that I'm using is as an Administrator to 2 of my associates. I can't seem to separate my contacts from my associates' when I create a lookup from the calendar. I'm also not so sure each associate does NOT see what the other has or what I have as "private". I find ACT! easy to use and open to my needs. The biggest benefit I see is that I can keep each email and attachment with each contact. Once I get to know how to work as an Administrator to my 2 associates, it will benefit all of us in keeping in contact with one another and knowing that they are keeping up with their work. The fact that everything is going to the "cloud" is nice but sometimes I like to be able to use the software that I am paying/paid for where ever I am and ACT still allows you to do this, with their offline client. The rare instances that I would like to be logged into 2 separate databases at the same time with in the same program or even in multiple instances of the program would be nice but with the offline this is not achievable (it is however doable if you use a mixture of either the cloud version and offline version or multiple tabs in the cloud version). The mobile app would also be really nice if it would work with custom virtual directories, as it sits right now you have to use the default APFW virtual directory which allows other customers using the web version to see what other databases are attached to that virtual directory possibly lessening customer anonymity. The price you see is the price you pay for everything included. So many of the cloud only based solutions advertise a much lower price than ACT but don't give you all of the features that ACT does, once the products have comparable features the price for the cloud only solution is either the same price or more expensive. Also with the v19 release of ACT a mobile app is available. Keeping all of my business contacts separate from my personal contacts. "Robust, powerful, on-site databases w/ backups to local or iscsi drives"
It has darn near every type of field available, action built-in and follow-up type of alert you could possibly think of. You can custom create more fields, run reports on all fields even those you created, you can customize the view and layout that every user in your organization will see, or create one for different departments that displays the fields they use the most. My accounting team loves me for this, as I created custom views for them that shows the customer information pertaining to their department. The backup routine is super useful and it works! You can setup what days, time and destinations to backup to, including network shares that are attached via iSCSI, local drive, external drive, or setup a routine to backup and copy it offsite. De-duplication tools are really useful and it integrates with email clients to record emails automatically that it matches to profiles inside your ACT! As it uses SQL databases, you can offload this to another server to speed up the processes and to grow the database to whatever size you require. It is huge. It is a mega-huge program and takes a long time to load. In today's world, we want speed and only load up the useful things pertinent to my job. I do not need it loading 10 thousand other things that I'll never use. Making it more customizable to remove all the excess items that are great, but I'll never use in my company, would make it less 'heavy' and much quicker to load. It locks up a lot when running huge reports. I always say test things first. However, with ACT, a simple test is outside the typical realm of how much time or effort one will invest to test out a product. It takes a lot to setup, a lot. It will require a dedicated server and is a resource hog. Do not try to deploy it in a VM environment...unless you can reserve all the system resources only for that one VM. Do not get anxiety with how many fields and actions exist inside ACT. Instead, just start small, task yourself with creating a look that works for you, this is called a Layout. Then create some customers. Consider what things you'd want to do with ACT, like follow up with a customer, contact them on their birthday, etc. Set reminders for these things and create a rule to automatically create them for future customers. This will alert you and perform whatever action you determine, such as send an email to the customer wishing them a happy birthday, or welcome them back from their vacation you booked for them, etc. Securely storing client data. It servers as our CRM and as it is a secure database residing on SQL, it can be expanded to meet your needs. It also helps to track email responses to customers by automatically recording the emails inside the database. "So quick - so easy - so efficient!" ACT! is the way to go for any Client Management system. It provides everything you could possibly want to organize, communicate, and keep track of information in a safe, guarded, and effective manner. I've been using ACT! for only the past 2 years and am finding out new uses for it to help our business - WOW! Honestly, I haven't found anything I don't like about it yet. There is just so much it can do - I feel I've barely scratched the surface. Communications, organization of client data. We now have the ability to send to a select few or to a large group e-blasts, newsletters, birthday - anniversary - wedding cards. It also allows me to sync the calendars in the office with my outlook so I know who is doing what without having to go into ACT! every time to check. "Excellent all round CRM application - Easily customisable for any industry"
Utilise the services of a trained Act! consultant to get the best ROI - DO NOT rely on an IT company and DO NOT rely on internal staff. The software MUST be configured to suit your business, your process, your services, your products. You may need the use of additional add-on software such as Seamless Opportunies to generate good quality Quotations and other documentation. Act! will only offer a good ROI if it is customised to suit the business requirements and users are properly trained. When Act! is implemented correctly businesses will have a full audit trail of client interactions. Once a customer has seen how Act! should be configured and they have been trained properly they love it. "20+ year user of ACT! Works great for my Recruiting Firm"
Currently on Act! Premium Version 20.0.159.0, Update 5 and easiest version ever to use. Fast, great response when running queries. Easy to enter data, keep track of my schedule, mail merges, very easy to customize the user interface and reports for my business processes. I've been an ACT! user since Version 2 and thoroughly enjoy the upgrades. The automatic updates are helpful to keep the application performing in an optimal way. The ACT! Community is very helpful. You can query for problems and likely see the response or solutions offered by others. If not, you can enter a new problem or request for help and usually another User or one of the ACT! employees will offer help. The phone support is always 100% perfect. I've needed help with a database or upgrade issues and I'll call the toll free number for support. The professionals are always friendly, knowledgeable, and usually resolve the issue on the first call. I run a recruiting firm and it is critical to keep track of candidates, communications with them and especially to keep track of the interview process & invoicing process. Keep track of contacts, events, Invoicing, and other related follow up activities. Ability to generate graphic charts to visually see the impact of sales per year, quarter, etc. is helpful. "A Business Must Have - BEST CRM Tool On The Market"
ACT is a great data base to house all our customers information. At the touch of a button I can easily create a mailing list for current active customers. Act is a CRM must have!!! You have to pay extra for customer support. For a small company like mine there are a lot of added features we don't necessarily need but because the amount of contacts we have is high we have to use the Pro version of ACT! ACT! is always improving their product to offer the latest and greatest to their customers. I don't have to give my employees access to my QuickBooks to access customer information, that is well worth every penny I pay for the program right there. You can utilize ACT as little or as much as you like, so if you don't need the marketing aspect you don't pay for it. Organizing customer information, making mailing lists and being able to search by field are key aspects of ACT! "Using ACT is very pleasent!" I use ACT primary to keep track of the different companies that the business I work for does business with. It enables the billing to go smoothly, and for all the different people using the program to call different businesses to leave little notes, so the next person is aware of any changes that may have occurred within that particular business. I feel that it has a slight archaic feel to it, there isn't a modern sleek feel. It doesnt work as fast as one may like, although it is difineitly reliable! I think the company could do with an update, or about 10. Be prepared for sale orders and purchase orders to be disconnected, in the sense that there is no way to have a drop down with all the POs linked to the SO in question. We are able to solve the issue that all the diferent employees are not necessarly aware of the changes that different companies undergo, and quite frequently. We are able to use ACT as the starting point for all company look ups, and therefore before I would make a call I would note what is updated on the company's account. This tells me what who I am looking for or who may have left the company recently, whatever changes the company may have had. I was referred to ACT! from another advisor. Before I purchased the software I was given a good overview of the functionality and capabilities the program offered. That way I knew that it was going to meet my requirements before I had to purchase it. I also liked the fact that I could pay for the program rather than having to pay a monthly rental. It was Canadian friendly ie: Postal Code vs Zip Code. Easy to keep organized with Activity Series and daily To Dos! I love the Emarketing capabilities for sending out Newsletters, Monthly Tips and Birthday Wishes! Being able to know where I’m at in the sales cycle. "Master of My Day - Best Business Tool On the Market Today"
The ACT! program, while being a very comprehensive and powerful database, is the primary resource I use for scheduling and record keeping. The interface with OUTLOOK is seamless and saves time and effort in setting meetings, calls and appointments. I use it for documenting my interactions with clients and have used it for legal back-up since 1995. The program is simply the Master of My Day - I do what it tells me to do! Formating the contact screen layout is a very involved, time consuming and complicated process. If it were more user friendly, the customizing of the programs personal utility for me would be easier and I would use it more effectively. The complexity is more cumbersome than it should be. If you are seeking a very comprehensive time, contact, sales and record keeping software that also provides easily compatible database tools and interface - GO WITH ACT! - you won't be sorry you did! Best business tool I ever invested in where computer services and utility is concerned. The business benefits that I reap from using the program have varied through the last twenty years I have used it. I have had several job descriptions over that period of time and the impact of the ACT! program has differed slightly between each one. Generally speaking, it is the time management aspect that I consistently benefit from. Other similar programs are not as easily applied to what I do. "ACT does as much or as little as I want"
I can use ACT as a simple contact management tool, looking up basic info. Or I can utilize more and more features as I need/learn them. I am now a "power" user and look forward to adding even more handy tools like event management. I have the desktop version. The online version did not "play well" with my Windows 7 PC and I was never able to access it online from laptop (also Windows 7) and phone (a Blackberry). This product works well for new and power users. You can start with the basics and add to your knowledge as you get more comfortable. The online videos are great. I keep learning new ACT skills, and I've been using it since it first came out, many years ago. This version is the best ever, with all sorts of additional tools available for specialized markets. Mine is a non-profit event planning business, and I love how easy it is to keep track of members, donors, events and projects. Capturing emails for each client, making notes on the fly while on the phone, scheduling follow-up. I love Groups! I look forward to using email marketing in the near future. "A great way to organize all of your contacts"
We have a large client base and it is a great way to keep track of our vendors, customers, and anyone we come into contact. It is one of the most helpful pieces of software we use in our office. It is very easy to update and add notes to each person in the database. I love the way you can sort contacts by groups so that if you aren't sure who you're looking for you can at least sort by industry. I haven't yet found anything I dislike about the program. I would like to get more into the program itself but at this time I have not yet experienced any problems with it. I think it is a fabulous database. It is one of the most efficient pieces of database software I have ever used. I am aware that there are more ways to use Act but I have have been exposed to those as of yet. But as far as the use of tracking customer contacts with email addresses and phone numbers. We are able to track movement of our customers from one place to the next which is extremely helpful in maintaining pricing and for what we do it is very important to track Technical Directors, Master Electricians, and other production personnel. We were able to create an email list for one of our events using the database and it was very helpful in finding customers whom we haven't spoken to in a while. "Act! is the hub of my business"
Act! enables me to keep all information about customers, prospects, colleagues and vendors in one place and manage them easily. I also really appreciate the reminders - no more having to remember to call someone back! Aside from some small things, the only thing I don't like is that I haven't taken the time to learn more about what Act! can do and how I can do it. As for the small things, I wish that, when entering a name to search for, the search is very specific. It'd be nice to have a more forgiving search ("similar to"). Also, if it doesn't find the name, it'd be nice if it would simply say, "Create new contact with this info?" Regardless of the size of your company, if you do not have a customer relationship manager to keep track of your business relationships, you are wasting time and energy. Especially small companies can't afford that unnecessary waste. You don't have to be a genius or a numbers person to get some value right away. So go! Get Act! I was wasting a lot of time trying to find information. Now I know it's all in Act! and it's searchable. "A Great Tool To Better Serve People"
What I like best about ACT is the simplicity in appearance and functionality as well as the support available. Because the screen is not "busy," you can more easily get on with business without the distractions. It has the functionality I need to manage more than one business. The support team is very relateable and helpful and fully addressed my inquiries. I like that I will be able to serve people more effectively my being more organized. I like the fact that ACT! is on the cloud and I won't have to loose critical contacts and information if my cell phone or computer is lost or stolen. Originally, it was that I had to commit to a year vs. month-to-month before I was really able to sink my teeth into it, but that was resolved. ACT! has a great track record and has been used by many companies I have been associated with. It is worth investing the time to learn how it can best be of benefit. I like knowing they have longevity and believe they are here to stay. I consider every contact I am blessed with to be of value and with this tool, it will help be to avoid overlooking anyone and serving them the best I can. I am looking forward to learning more and taking my businesses to the next level. Organization. Although I am still in the process of transition from paper to CRM, I am confident that it will be helpful in accomplishing my goals. I will take discipline on my part, but long-term it will help me to be more productive and profitable. "ACT - Great CRM Tool"
Act is a great Customer Relationship Management Tool where you can add all your active and prospect database. And you can look up easily any client profile you wish with all contact information and details you need. You can add some notes to each customer and then add some reminders or notes, very useful. With Act software, you can't see payment details about each account and resolve past due invoices. It is hard to do customer orders resolutions with that. Also Act could be slow and you can just navigate from 1 to 1 account and can't treat multiple accounts at the same time. I recommend Act is you want an easy and simple C.R.M software to ad d basic information like visits, last order, orders details and what items ordered per customers. For each client, you can add some details notes and details information. I don't recommend it if you need to do accounting or others purposes that basic CRM tasks and email and/or phone marketing or sales campaign. Act is very useful to add details information for each account, you can see the main contact, his job profile , email address and phone number. You can do an easy email marketing campaigns with Act and do some follow ups. For each account, you can add date about last order, last visit and create any useful units you wish to organize properly your database. You can do different look up and select some specific clients. "Customizable CRM, UI not the best"
The one-time fee, responsive support team, customizable CRM. Keeps a record of all communication with clients if linked to Outlook. UI is not the best. Most of the functions are not intuitive. It does not work on OSX. I end up carrying two laptops around all the time, one for Act and my mac for everything else. I would not recommend this CRM to anyone just on the basis of the UI/UX. If your users use OSX, please consider getting a different CRM. The user experience is not good at all, especially if you compare with more recent CRMs. One advantage of using Act would be the one time fee, instead of a monthly subscription billed per user. Right now we're using Act to save contacts, generate documents like quotations, sending out marketing emails, and also for tracking communication history with clients. We also store the physical equipment bought by our contacts. For tracking leads/opportunities - not useful, we use excel sheets instead. Response from Gary Woodhouse of ACT! Thanks for taking the time to post your feedback. Did you know that Act! v20 includes an updated modern UI? Check it out after it launches later this month. We have a number of customers that run Act! on a Mac using Parallels. Have you considered this option? It's also possible to access Act! Premium in a web browser which could give you another option for accessing Act! on your Mac. "ACT! Keeps our company organized." I like the power of keeping my contacts organized and in a single location. I also like the way ACT! integrates directly with Office 365 to manage my contacts. The only item that I have found challenging is that my old calendar printout has changed to a new format. Just a preference thing. We have been using this product for more than 15 years and have recommended to many other companies for contact management. We are a small manufacturing company that has customers across many market segments. ACT! helps us keep current with all of our customers by prompting follow-up with them. The efficiency of the built in filter options on ACT! are superb and give us the end user very few limitations for what we use the database for. Another fantastic feature of ACT! is the ability to caption and attach files to each record, giving full tractability across the database. ACT! Emarketing templates need to be resembled to create a blank template. The alignment of paragraphs is viewed differently across devices such a PC's, tablets and mobiles. It is rather difficult to gain uniformity throughout the mailshot - Some letters become obscured and fonts change sizes. Fantastic tool for Small - Medium size businesses looking to keep all their contacts at their fingertips. ACT! Can be used as a standalone database simply for keeping track of business contacts or as a more in depth Cycle management system. With all the features built in, there is very little need to integrate with 3rd party software, however can be beneficial to link with programs such as SAGE. The reports are all ready to use, making the ideal choice for meeting preparation notes or powerpoint presentations. This program is ideal for beginners, novice or experienced users. Filing has become a easy in-house process without the need to outsource. We have used the Emarketing to reach our entire audience and in some cases targeted mailshots with a good open rate. We received updates though the portal regarding our successes. ALL my information about each client is in one easily accessed location. I can segment by industry, area of the country, past programs, budget, etc. And, I can send an e-newsletter to 3,000 quickly and efficiently. I am honestly completely satisfied - and have been since the mid-90's when I first chose ACT! as my contact management program. Being a professional speaker who has spoken throughout the U.S. and 17 foreign countries, I have A LOT of clients and A LOT of information about the needs of each. It is imperative that I answer their questions as imy seminars relate to their needs rather than a generic response. Having my client's complete record at my fingertips , even when I receive an unexpected phone call, allows me to help clients in a timely manner and show them that I genuinely care about them and their goals. "For the price, best around"
It is easy to customize and work with. It is totally portable regardless of which device I am using PC, Laptop or mobile device. It is easy for me to attach word documents and send them with the emails from my contacts email address. I can be quirky. I get errors from time to time that seems to hang it up. I can reset the menu to have only what I want to see but it will always revert back to factory settings. It drops my connection to Outlook and Gmail on a weekly basis. Not all resellers are created equal and neither is their support. If you are using a hosted version make sure that you select a reputable host. I am a recruiter. WIth the customizations I have added, I am able to use the application to track my candidates and customers. I especially like the opportunities. It makes it easy to track the candidates I have submitted to each job I am working. "Great for sales, not marketing or large organizations"
Act is simple to use. It has some features, like bulk updating of contacts for almost any field, that I took for granted. Act is great for individual salesmen or small sales teams. It is not the greatest for large organizations, as the reporting data and automation is lackluster, and permissions are not as robust as in other solutions. Act finally seems to have gotten it together with their latest 2 releases, but they still have a long way to go to catch up to other players if they want to be a solutions for larger organizations. Frankly, I'm not sure they will get there unless they completely ditch .ASP framework. Act was adopted first by one salesmen in our company, but it quickly became property of the marketing department to implement an e-mail marketing strategy. Great tool for keeping track of contacts and appointments as well as when to follow-up with clients. I never miss a appointment when I use ACT! I really do not dislike anything about ACT! Maybe I dislike the fact that over the years, I have become dependent upon my ACT! ACT! makes my follow up times and following tasks so simple. The layout of the cloud version and desktop version...Especially ver 19 and 20. I can't wait until I can incorporate Alexa into it. Hard to strategize how to incorporate it in my business, what forms, reports and best practices for my businesses. I have two businesses. Real Estate and Advertising and I currently have to use two CRMs. I'd love to just use ACT!. Active and proactive communication and connections. Convergence opportunity of CRM and accounting. I have used the product for almost a year and have started to build an affinity for it. I think it would be able to do a lot of what I want it to do but I just don't know how to get it there. Response from Jonathan Taylor of ACT! 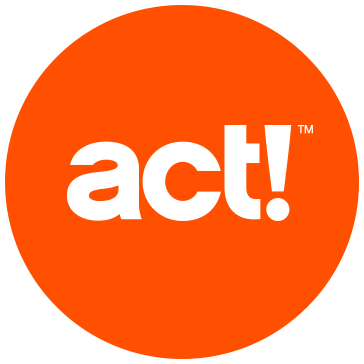 We've made quite a few changes to Act! since your review, and I was wondering if there's anyway we can help you get the most out of Act! If you're having any trouble, or would like any advice, please feel free to drop me an email at community@swiftpage.com - I'd love to help! "Excellent communication skills and problem solved in a timely manner"
Professionalism and experienced technical support. Willingness to help with no impatience. I always can depend on the Technician being very knowledgeable and easy to deal with. My problem is always resolved with as little effort on my part as possible. I use Act for all my databases and emails. I truly believe it to be the best program for business needs. I had to purchase another support contract because the one I bought in 2017 had just expired. I paid for a year's support and only used it once. I was on hold for the sales department for a long time and an even longer hold for the technician. He had me download a remote program so that he could access my computer and that took longer than I expected. I am very satisfied with the results but i don't like having to pay and then not need it but the one time. SQL disables after any Windows 10 upgrade. The benefit is knowing the ACT technician will get it corrected. "Easy to add new program"
Makes my life easy to stay in touch with my customers. I have been using ACT since the 1980s over that time they are always making it better to stay current or better than other CRM systems. If I have a complaint is that it takes longer to talk to their support department than I like! Now that being said once you talk to the support person they are very knowledgeable and professional and have always helped me with any of my questions. With over 9000 contacts in my ACT data base the features of the system and the interfacing of Outlook help me stay current with all all my customers and the projects that i"m working on ! Standard form letters and emails out make my also help with customer management..
"Powerful Software that is easy to learn and extremely customizable"
I was brand new to CRM software when I learned ACT! and found it extremely user friendly and could immediately see its wide breadth of features and how powerful it can be to a business. To have some of the functionality we wanted to have like importing old data into the opportunities and also setting up views in the opportunities we needed to purchase additional add-ons. We use ACT to track upcoming opportunities, existing project details, client contact information. It is a great one-stop place to access project and customer data and has really helped us when assemble past performance information, keeping up on project opportunities and keeping in touch with our clients. Swiftpage integration and GROUPS. When I send an email blast, the pre-selected contacts in GROUPS is very helpful. I find using Swiftpage very user friendly. I wish the template editor was easier to use, especially importing images. I discovered that using a Swiftpage template allows for easier importing of images. When I create my own email template, I'm limited to text only. Creating a new email template does not automatically get saved in ACT. Since I upgraded to ACT Pro, the program has frozen on me a few times that required rebooting. I've used ACT since 1995. My current database = 13,000+. Using GROUPS and Swiftpage email integration are very efficient. I'm a one man show. ACT allows me to look like a bigger company. I stay in touch with my customers via email blasts using Swiftpage for $30 per month. I'm still evaluating the necessity of this ongoing cost. At this point... not much...I seem to be spending too much time during my day trying to fix the problem. Customer support at Keystroke CA are either out of their league with my issues are just don't care...either way, I am fed up enough that I am putting this review together. The software was ok when I had one office. We had many syncing issues with the mobile version of it HandHeld by J2X Technologies which meant any information we got lacked credibility. We eventually cancelled that subscription and tried to use the one with access to the web server but we've had too many issues to use it so we have stopped using that. Once we opened a 2nd office we purchased 2 brand new pc's and set the network up but have had nothing but syncing issues sincce day one. It has been 3 months so far and it seems that everyday we have a syncing issue. Again, any info that we get lacks credibility because we don't know how current it is. The support staff has tried to address our concerns but, to date, has been unable to fix the issue(s) and now I am told that if they are to continue providning support that we will need to buy a support contract, which I wouldn't have a problem with except that the software syncing has never worked properly. Is it wrong to expect the software to work properly without having the company require that I pay more to make that happen. To be fair to Act, we are using a reseller....Keystroke CA. I cannot imagine a scenario that we would continue to use this reseller...or Act. "It's cheap and useable but archaic and ties into NOTHING but Outlook"
It's cheap and you can use it as a database. It can be used for drip marketing a LITTLE but only for sending the emails and not recording email responses etc. Chatting w/ the free support can be good or bad. NO other tools, applications/program connect to Act! The support is in India and sometimes it's good and sometimes not. Because chat support is limited, you have to hire a Certified Act! consultant and there are very few. Really, there's like 5 and the certification doesn't guarantee much help. Once certified consultant was listed on the Act! website but was no longer practicing, another was highly unstable and damaging and the other was only helpful 1/3 of the time. No joke, our time was him talking about him being retired and related to Walt Disney. His support staff was his out of work son... Yikes! I'm reaching out to customers who've had issues in the past, and seeing if there's anyway I can help them to resolve longstanding issues. If you're still experiencing problems, I'd love to help. Feel free to drop me an email at community@swiftpage.com. "ACT! is still great 25 years after I started using it as my main CRM tool." ACT gives you the ability to keep up with an unlimited number of people and still treat everyone as a special customer/supplier/person, etc. Once you learn how to use it, which does not take very long, you can use as much or as little as you need to get your particular job done and done right! It has very strong search tools, and it is much better than Outlook in keeping up with meetings, calls, and to-do's. As you become more familiar with ACT, you will be able to use more robust features, and you can start customizing ACT to better fit your needs. But you don;t have to; that's the great thing about ACT. Start with the basics and learn as you go. You will love it, even after 25 years of using it like me. Although ACT is easy to learn, there is so much stuff in it, that it sometimes slows you down in getting through menus, actions, etc. Keeping up with lots of people at the same time. It makes me more productive and allows me through customization to have the information on each person to make them feel special. ACT! is a good CRM (Contact Relationship manager) By entering your contacts and their company, you can keep good notes on your activity with a contact at a customer. Choose something else if you are an "enterprise" ACT! will work for a small group. Tracking sales and attempting to maintain multiple customer sites - ACT! does NOT work well for this! "Integration with Outlook doesn't work, and they won't fix it. Evaluating alternatives"
That they either refuse to fix or cannot fix a problem with basic functionality. A CRM system is supposed to increase efficiency. ACT Pro succeeds in this in some ways, but fails in others due to bugs in the system. Key among these is the interface with Office and Outlook (ACT crashes every single time I try to create an e-mail from a template, or send an e-mail either to a single contact or to multiple contacts via mail merge. Furthermore, e-mails no longer attach to contacts when sent, and they no longer record in history. And on a completely separate note, every single contact's LinkedIn profiles is, "oops". And occasionally I get a pop up window which says, "Click here for updates." Clicking does nothing. Listen to your users, many of whom - like me - will see be former users - and fix your damn product! Thanks for taking the time to review Act! We're aware that some users are experiencing issues with Outlook integration at the moment when running the very latest version of Microsoft Office. We're working on a resolution to these issues as our top priority right now, and will release an update to address them as soon as we can. I have customized ACT! so that it works for me. I really appreciate using a CRM to help me stay in touch with my customers. ACT! is a very old and out of date program. I don't use the new cloud program. ACT! has SO many problems that you really need to purchase the service agreement, because you will need tech support. Did outlook just do an update? Did Microsoft just do an update? Then ACT! will probably have a problem. Don't. There are so many other programs out there. Every year, before my service contract is due, I look at all the other systems out there... For me, I have customized ACT! so much, and I want the program to reside on my hard drive, and I don't want to pay monthly, currently ACT! is the only program that fits that criteria. What are your needs? How much hassle are you willing to put up with. If there was another program out there, and I wouldn't lose a lot of my data converting, I would switch in a heart beat. I have all my customer information in one place. I also have it backed up in 2 seperate clouds.I can create email lists/groups to segment my contacts. I keep notes of what we talked about, for the next call. I can set reminders of when to contact my customers next. I'm really sorry to hear that you've had technical issues! With the latest version, we've really focused on addressing bugs and issues that can interrupt workflow - especially when integrating with Microsoft Office! It's great to hear that you're still with us, and we look forward to having the opportunity to change your opinion on the software! "The very best and easy to use CRM program "
I have used ACT since it began and it only improved. It is the easiest to use and can had customization for searches. I am not using version 20 and it is a real tool in developing business and creating relationships. The database configuration can be testy. Good product that improves and doesn't change for the sake of change, making it easy to use. It is a log of activity and helps me remember important information I can search and sort. "Not the most user friendly salesforce- but gets the job done"
I really dislike the format. The interface of this salesforce is not very inviting and all the colors are boring. It makes work feel more like work and the interface is very outdated. I don't really like the opportunity tabs, never really look at it. I like it better in salesforce where you can just change it to closed won. I personally wouldn't recommend Act! While this may be a cheaper version of the options available to companies, it's interface and ease of use, is not up to standard. Some of the fields are hard to find- ie. For the add note function is hidden on the page as a tiny icon. Once you get used to the system, however, it works fine. I am an account executive so I am adding new contacts and reaching out to old and new leads. The benefits of this salesforce is that we also use Microsoft for email and this integration helps me track my emails. It make sure I don't send the same email out twice. Thanks for your valuable feedback. It's great that you made good use of the Outlook integration - it can be a really valuable tool. It sounds like the User Interface and Layout didn't quite work out for you, which I'm really sorry to hear. Did you know that the most recent version of the software, v20, has a redesigned modern User Interface? We've tried to make it easier to find and use the features that you use every single day. Thanks again for the feedback, we're always looking for ways to continuing making Act! the best CRM solution for SMBs. Being able to manipulate data in my Database. I love the way it integrates with the remote database on my laptop. I can be out doing sales calls on day. Keep all my notes and updates on my remote database. And then sync it to my main computer in the office. I use the exponencia auto-dialer and can make my calls using skype or majic jack. When on the road I have mounted my laptop in my car and can send them customized templated emails with pdf attached sales brouchures immediately using the hotspot on my phone about our meeting. That impresses a lot of clients. I can keep notes so I can have total recall of my last conversation with them. I can access their web page and their social media pages in tabs that make it very easy. And I can create limited custom fields and totally manipulate data in my database without programming. I can program in Access, but it's just not worth it because Act does is really easy. I've been using act since the beginning. I've looked at others, and keep up with the new web based browser systems, but none can offer the power of Act pro. Used it from the beginning. Nothing!! Now Outlook on the other hand, is a pain. I've shut off the Outlook 2016 updates. I found I'd just get Act communicating well with outlook, and outlook would update it and mess everything all up. The only think I use outlook for is to send emails through act so I just stopped it from updating. That solved that problem. If you want to control your data and be able to manipulate it easily and efficiently, Act Pro rocks!!! If you do a lot of phone calling I'd marry it to the exponencia plug in that auto dials in skype, majic jack etc. I've mounted a laptop in my car. I can meet with a client and leave, send a custom email to them almost immediately. Handheld Contact works pretty good if your into typing on a phone. I type 100 words a minute on a laptop so the phone option hasn't worked for me, even though it works great. Just can't get used to phone keyboards. All my sales contacts. I do all my marketing from ACT. I can manipulate the data in my database and set up very complex data pulls. I use the skype add it from exponencia that allows me to click a button and it auto dials a call. After the call, send a followup email, and the email and notes of the call are there forever. I keep abreast of the competition for act. Nothing comes close. "Long time user for contact manager "
"ACT! and Swiftpage WORK for me"
Ease of Use, Simple, Better Than Excellent Technical Support. The feeling of confidence when I use the app. I am accustomed to appearance and responses to inputs. No Dislikes Presently. But would technical help 24 hours. When I call for reasons other than tech support sometimes no one answers. As I recall, the bids could be best prepared by a template for the opportunities. I am accustomed to the ACT interface and I find others to be less comfortable. Tracking email campaigns. contact details, using groups effectively. Staying on top of day to day activities as well as longer range goals. "ACT CRM Software is Great"
Act is comprehensive CRM software that allows you to integrate email and marketing along with contact information and prospecting notes. I use an older version of ACT! (2013) so the tech support is minimal. It was purchased by Sage a few years ago so they only support the newer, web-based versions now. You have several options when considering which version of ACT! to purchase. The current, web-based version has a lot of features the older versions don't have such as tech-support and the ability to access your information from anywhere. If you don't need mobile access to your CRM, you can purchase older versions of the software from 3rd party vendors. That worked very well for me but I must rely on forums for any tech issues. It's a trade-off so you have to weigh the needs of your business against the cost. You will pay much more for the newer version and the rate is on-going versus a one-time payment for the older (DVD) software. It can be difficult to keep track of client information and contact notes. ACT! has helped me to keep everything in one place. The email integration has made finding communication between clients and myself much easier! "Act! Makes our business flourish"
The ability to customize and really make this a system specifically for our use. We have used other CRM's in the past...and come straight back to act! as it is the only product we have found that can accommodate our needs. When building additional contacts within a company, it often times comes up with "you are creating a duplicate record". This causes confusion but with training can be worked around. We would love the ability to access multiple databases at the same time as well. Ease of use makes this a highly recommended product. It has great integration. We have several databases within act!. Our sales division, staffing division, and marketing divisions all utilize specific databases within the system. We have managed to integrate act! with our website, specifically dealing with our staffing side, which in turn has saved us over 800 man hours annually. "ACT is the BEST CRM. I've Used It For Over 20 Years!!" Act is GREAT software! There are so many features that totally ROCK!! First, I can almost totally manipulate my database right from within Act. I used to program in Dbase and Access. There is no need in Act. And then there is the remote database sync. I can be out on the road all day and when I get to the office I just sync it. It would be more reliable to have your own word processor/email instead of Microsoft Outlook as the pass through. Act used to have it more integrated. Would love to have that brought up to speed. Microsoft just doesn't want to play nice too often. I've tested all the web based products. The desktop version of ACT just provides the most flexibility. I just don't drop appointments and prospects when my act is in service. It really matters. Again, it's great not to have to manipulate the data outside Act. Act pretty much has me covered. "ACT is an amazing database "
It syncs all my contacts with my iPhone and reminders come up automatically 30 minutes in advance - Never miss an appointment! It is the best way to schedule all your appointments and activeties and keep all of your contacts. It's like a roladex of the 21st century! I owe my business success to this tool! Keeping track of clients and potentional clients and timing to call or reach out again. "Great for all of your Customer Retention and follow up!" Having Act! in our arsenal has really helped improve sales and keep all of our customers happy. The fact that you set calls and can upload all the documents right into ACT! helps keep every thing organised. Easy to implement and does not require a rocket scientist to use. The google integration along with Outlook helps us every day with reminders that pop up and make noise. This stops everything your doing in ACT! and makes you read what the reminder is. This gives you a clear picture of what your next objective is. The only problem we have is random crashing with never versions of windows or Microsoft Outlook. Tech support is amazing and will fix any issue you have with a simple call. The look of ACT! is a bit aged as well. Has a 1985 look that need to have a better GUI. I think with time ACT! will just keep getting better and better. I am always looking forward to the next update and mobile use. The most beneficial part of having ACT! is being able to track all of my sales guys from anywhere I need. the software does not require the internet which makes everything easier for all of us. Staying on top of my potential clients is a major necessity and this software really fills that issue for us. Being able to stay Mobile is great! Whatever information I have, I can attach to the contact. It has a perpetual history as long as the contact is in the database. I can also set up Groups. I use it not only for buyers and sellers but personal groups with the ability to produce mailing labels, etc. I have been a user of ACT! since about 1990. It has many more features than I use at the present time. There is nothing that I dislike about the program. I can write letters and Emails to contacts and it auto stores. I can enter daily information on a client that could be used in court if I ever needed to produce the information for client history. Log daily actions with customers and clients. Try it! Garanteed you'll love it. Just the fact that I can recall information that I have entered about a client, potential client or customer is extremely beneficial. I have repeat clients that use my services over a span of several years. Of the many Real Estate Agent programs I have witnessed over the years (approximately 30 years) ACT! has not only proven to be a program still in existence, but is still going strong. I chose ACT! when I started in Real Estate because it's base program is generic and it had a side program for the Real Estate world. It could be used (adapted to) for any kind of business. Very flexible. "Over 20 years experience with ACT"
Available on desktop and cloud. Easy to customize. Maintain a history on activities or fields you choose. Works well with Office (word/outlook). Easy to use on a basic level (intuitive), very complete on a complex level. Very Fast. Will handle large database with lots of users. Extensive lookup's for every field are easy. Activity series are easy to create. Creating and maintaining groups of records is easy. Import and export using excel is easy. Can link and attach other databases. Company support options leave something to be desired. Try it first, especially if you have a large database and need a solution that can be based locally and easy to customize. You can do it easy or hire a consultant if you want to go complex. Multiple sales people with different territories work remote, changes internally with remote people work well. This program has increased our bottom line. If you feed it, it will feed you. "Act! is an Administrative Life-Saver"
We have used Act! since the DOS version to maintain the student records for our nontraditional Seminary. From consultations to maintaining student records and transcripts, it does a great job! Sometimes MS SQL and Windows are a little touchy. Nothing that cannot be overcome by restarting the MSSQL under "Services.exe"
CRM and so much more. You can customize the program for a wide variety of administrative needs. Maintaining student records and CRM for our student body. Saves us thousands on specialized software designed for academic records. The software is so each to manage - we are able to use a shared database and our in office and mobile users are able to have instant communication. We truly like the product - and use their knowledge base system frequently. Would like to be able to have access to pull back an email campaign within minutes after it is sent. It is used for both our CRM and Email Marketing. It gives us instant details and keeps our team of users in the know on each customer. We get a great return on our email campaigns too. "ACT is Different...In Many Good Ways"
The best part of ACT as a CRM is that it is very customizable. Many platforms today are customizable, but will not let you lay out the user's screens the way ACT will. Their cloud version. I have only test driven the cloud version and talked to consultants, so my knowledge is limited, but ACT in the cloud has limited functionality compared to running the software locally. And the cloud version seems buggy. Compare carefully the desktop version and its functions vs. the cloud version. Also be aware that ACTS support can be challenging. I have had good and bad experiences with them. Even reading the ACT community help can be challenging because they have so many versions and updates over decades. "I wouldn't be as successful without this tool"
I can score leads and schedule a marketing plan based on that score. The automatic alerts tell me what to do when. All the contact info is safely stored and easily searchable. I also appreciate being able to view the entire history of interactions with each contact. I get a weird error message every time I start up the program and a different one when I exit it. Lead gen, lead nurturing. I couldn't really do business the way I do without this tool. I would recommend it to anyone who runs regular lead gen and marketing campaigns. * We monitor all Act! reviews to prevent fraudulent reviews and keep review quality high. We do not post reviews by company employees or direct competitors. Validated reviews require the user to submit a screenshot of the product containing their user ID, in order to verify a user is an actual user of the product. Hi there! Are you looking to implement a solution like ACT! ?